The need for a global program to identify and educate the rising generation of scholars and leaders in the field of law and religion: Legal restrictions on religious individuals and groups remain high or very high in many countries of the world, and these official obstacles are often combined with social hostilities regarding religion that are increasing around the world. Sometimes these problems rise to the level of persecution of religious minorities, or even genocide, but more frequent are problems that arise from discrimination, social marginalization, and the ordinary problems of lawmaking, enforcement, adjudication, and regulation. With its experience in creating and supporting international academic training programs and its network of legal experts, the International Center for Law and Religion Studies (ICLRS) is committed to identifying and training the next generation of scholars in the field of law and religion at the Advanced Certificate Program on Religion and the Rule of Law at Oxford. Beginning in summer 2018, 15-10 international graduate students will be admitted from human rights and comparative law backgrounds for this advanced 3-week training course in international and comparative law and religion. Participants will also take part in an online spring writing class and individualized writing sessions in Oxford to produce a publishable English-language scholarly article. Students will have unique opportunities to present their research and network with other emerging law and religion scholars and receive a valuable academic credential. Designed primarily for early-career academics interested in the field of religion and the rule of law from an international and human rights perspective, the Program has a legal focus, but applicants need not have a background in law. Applicants from other fields are welcome, including religious studies, human rights, international relations, politics, sociology, history, etc. The following guidelines will help you decide whether you are a good fit for the Program. The Program is intended primarily for young professors, lecturers, fellows, as well as advanced-level graduate students. You do not need current employment in an academic job or enrollment in a graduate school program to be eligible. We welcome applications from individuals working for international organizations, religious and human rights NGOs, or people working on interfaith dialogue. Graduate students who are currently working on their PhD dissertations or Master’s thesis are welcome to apply, but it will be helpful if their dissertation or thesis is on a topic broadly related to the field of religion and the rule of law. You must have an interest in publishing scholarly work. 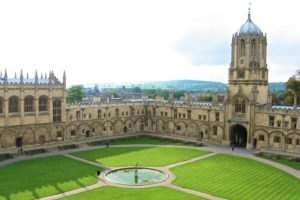 You will begin working on a writing project in the months leading up to the Program, and each afternoon at Oxford you will participate in a “writing boot camp” focused on completing a scholarly article for publication. You must have ability to do academic work in English and finalists will have a Skype interview. Students currently in undergraduate studies should not apply, but we would welcome you introducing yourself and letting us know about your future academic plans. Applications should be completed online. The application will include a personal statement, a research proposal, a resume, and a letter of recommendation. The personal statement should explain your academic and career interests and how participating in the Program will contribute to your career goals. This is an opportunity to introduce yourself and to explain what you can add to the Program. The Research proposal should be a brief explanation of an article you are writing or propose to write relating to the field of law and religion. This should be an article that you hope to place in an English-language scholarly journal. Preference will be given to applicants who have a well-developed research and writing proposal. Your resume should summarize your academic and employment history and include academic presentations you have made as well as publications in English and other languages. 1: Please let us know why we should consider you as an applicant for this experience. This is your personal statement and should be around 500 words (double-spaced, two pages). 2: Please submit a research proposal for a future article. This should be around 250 word (double-spaced, one page). 3: Please submit your resume and a photograph. 4: Please submit a letter of recommendation from a teacher, colleague, or employer. Student grants are available for travel, accommodation, and tuition. The Program has some grants for admitted students to attend who otherwise would be unable to do so.